If you have ever owned a dog you have most likely heard about the dreaded canine parvovirus otherwise known as “Parvo”. Parvo is a potentially fatal disease that most often affects young or unvaccinated dogs. It is caused by a virus called canine parvo virus (CPV). Infectious usually occurs following exposure through ingestion of CPV contaminated feces or inhalation of CPV contaminated feces. CPV is a very hearty virus and can be stable in the environment for months to years depending on conditions in the environment. CPV replicates in lymphoid tissue in the oropharynx, thymus and mesenteric lymph nodes. Replication of the virus typically occurs 1-5 days after infection and attacks the rapidly dividing cells of the bone marrow and intestines. This infection leads to destruction of the white blood cells as well as the epithelium of the intestinal cells. Puppies infected in utero or before 6 weeks of age can also develop damage to the heart. Once infected, parvo is highly contagious. The incubation period until clinical signs are seen is typically 7-14 days. Clinical signs are typically severe with parvo, and the most common clinical signs include lethargy, inappetence, depression, vomiting and diarrhea. The diarrhea is usually very bloody and foul smelling. Affected dogs are usually very dehydrated from vomiting and diarrhea. They may also have a fever, abdominal pain, pale gums. More severely debilitated animals may be severely weak, have collapsing episodes, have seizures or develop shock. Parvo can be fatal if not treated properly. Suspicion of CPV infection is usually based clinical signs and history of lack of or inadequate vaccinations. CPV is usually easily diagnosed by a quick, inexpensive in house antigen test. Although false negatives are possible in early and late disease, the test his highly specific for the disease. Bloodwork is usually performed which typically will show a markedly decreased white blood cell count. Because CPV is a viral infection, treatment involves symptomatic support. Affected patients often times require intensive hospitalization and supportive care. Treatments include aggressive intravenous fluids to counteract dehydration and electrolytes imbalances, antibiotics to treat secondary infections, anti-emetics for nausea/vomiting, analgesics for pain and nutritional support. Depending on the severity of the infection, hospitalization usually ranges from several days to weeks depending on patient response. Prognosis is usually fair if treated early and aggressively but fatalities can occur and complications can be seen. 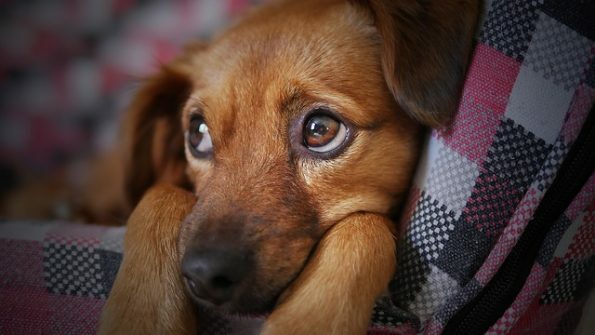 Once recovered, dogs tend to have no long-term consequences. Vaccination is crucial in the prevention of CPV infection. CPV is considered a core vaccine by the American Animal Hospital Association and is recommended in most dogs. Puppies can start vaccines as early as 6 weeks of age and continue every 2-4 weeks until at least 16 weeks of age. Vaccines are then given a year after the first series and then typically every 3 years. The vaccination is very safe and effective for preventing CPV. Overall, CPV is a highly contagious and potential fatal viral infection that can affect any dog but is seen most of the time in unvaccinated or under/improperly vaccinated dogs. Clinical signs can range from mild to severe and death is possible. Fortunately, CPV is highly preventative with proper vaccinations. It is important to talk with your veterinarian and the proper way to prevent potential CPV infection in your dog.